This recipe is famous. We always make it for Thanksgiving, but it certainly works just fine on any day of the year. You are reading our Recipe of the Week newsletter. In 2017 our main monthly newsletter will feature brand new recipes that we add to the TexasCooking.com website. If you do not already receive our monthly newsletter, subscribe here. 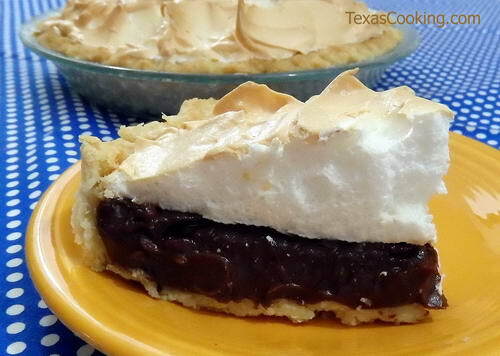 This is one of the best pies you will ever make, especially if you're a chocolate lover. Its ingredients do not depend on any season, and it is mouth-wateringly good served warm or cold. Separate all four eggs. Set egg whites aside in a large bowl for the meringue (see Notes, below). Put the yolks in a heavy saucepan and beat well with a fork or whisk. Then stir in the sifted dry ingredients alternately with the milk, adding just a little at a time to keep mixture smooth. Cook mixture over medium heat, and add vanilla when it begins to boil. Boil, stirring constantly, until mixture thickens. Remove from heat; beat out any lumps that may have formed. Pour into baked pie shell and top with meringue while filling is still hot. Bake in 350°F oven until meringue is lightly browned, 12 to 15 minutes. Notes: To avoid a "weeping" meringue, do not allow the filling to cool before putting on the meringue. We talk in depth about the meringue portion of this recipe in our post Secrets to Good Meringue. You can make this pie in a Standard Pie Pastry or a Vanilla Wafer Crust. Although this recipe calls for whole milk, I have used 2-percent milk with very good results. Important Texas stuff this week. Two Places at Once: Slow Cooker Sausage, Spinach and Bean Soup recipe, Imperial Sugar: Praline Apple Pie Cheesecake recipe, ATX Eats and Treats: Top 5 Wines from Becker Vineyards, So Much Life lists First time in Austin? Here's where to eat!. Terlingua International Chili Championships , Nov. 1 - 4 the CASI International Chili Championship is Saturday, November 4th, 22nd Annual Texas Book Festival, Nov. 4 - 5 always great for fun and discovery!. Austin360: Times have changed! A delightful review of the late John Kelso's BBQ joint columns from 1978. Houston Chronicle: Houston's Goode Co. BBQ celebrates 40 years. Texas BBQ Posse: there's a new way to light the charcoal. Extra 30% off at Macy's VIP Sale. Shop now at Macys.com! Valid 9/17-9/25. September is National Biscuit Month & Better Breakfast Month --- see our full list of American Food Holidays. NYT Food: Pistachio and Rose Water Semolina Cake - "World's Best Chocolate Cake"
Urban IPM answers questions regarding Texas' recent problems: huge floodwater mosquitoes and floating masses of fire ants! Video of the Week: A visit to Bonham State Park. Serve food on colorful Fiesta dishes. See the newest colors: Daffodil. Manufactured in the USA!